Prior to joining EWA, Marquita spent 10 years as a reporter at newspapers in Virginia, North Carolina, and her home state, Mississippi. She covered education for almost all of that time. Recognition for her work includes awards from the Society for Features Journalism and from the press associations of Mississippi and North Carolina. In 2016, she participated in ProPublica’s inaugural Summer Data Institute. She credits much of her growth as a reporter to training she received from EWA. Marquita has a master’s degree in interactive media from Elon University. She has a bachelor’s degree in journalism and political science from the University of Mississippi (Ole Miss). It’s time for education reporters to take back coverage of school funding. Too often, news outlets rely on journalists covering state government to also report on money for schools, said Daarel Burnette II, a reporter for Education Week. But journalists on the education beat bring valuable context and perspective on how schools work and the impact of funding. “This is within our wheelhouse as education reporters, so don’t forget that,” Burnette advised journalists in November during an Education Writers Association seminar on educational equity. For now, the early March deadline the Trump administration gave Congress to decide the fate of Deferred Action for Childhood Arrivals is moot. Major parts of DACA, an Obama-era program created to provide temporarily shield from deportation some young immigrants brought illegally to the United States by their parents, will continue amid legal challenges to the program. For journalists already enduring understaffed newsrooms, shrinking news holes and daily deadlines, social media platforms such as Facebook and Twitter may seem more like an additional burden than a useful tool. But they don’t have to be. Social media can be a powerful tool for culling sources, breaking news, and promoting your work, among other things. Can Fresh Attention to Rural Schools Fix Old Problems? Telling the stories of the nation’s rural schools means better understanding what they offer the roughly 8.9 million students enrolled. It also involves understanding the communities around those schools, the students attending them, and the challenges they face, a panel of educators and journalists explained recently during EWA’s National Seminar in Washington, D.C.
And one of the most important stories to tell about rural education involves inequality, said Alan Richard, a longtime education writer and editor. One of the most important things a reporter can do, particularly on the education beat, is follow the money. Tawnell Hobbs, the national K-12 reporter for The Wall Street Journal, shared insights and advice drawn from many years on the beat during an EWA webinar last week. 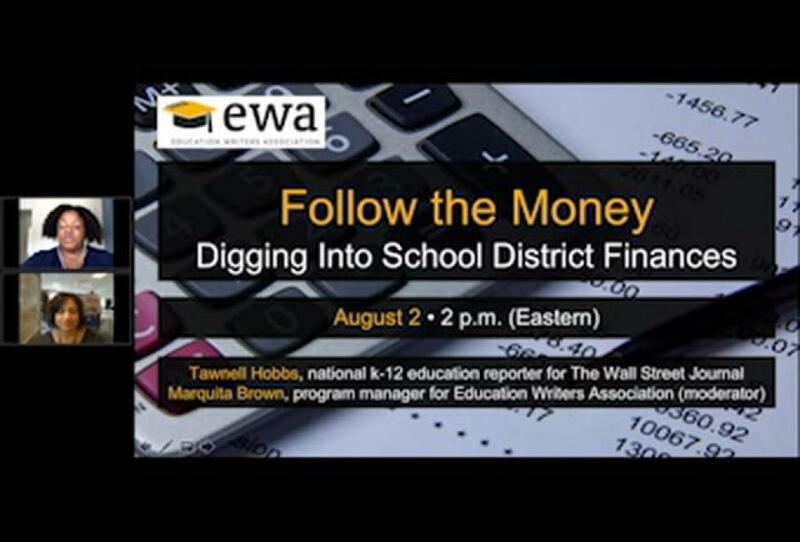 Download Tawnell Hobbs' presentation about following the money on the education beat. View a PDF of Hobbs' PowerPoint presentation.